The Queensland Art Gallery’s Gallery of Modern Art (I’ll call it GOMA for short) is located in Stanley Place, South Brisbane. It opened back in 2006 and focuses on art of the twentieth and twenty-first centuries. 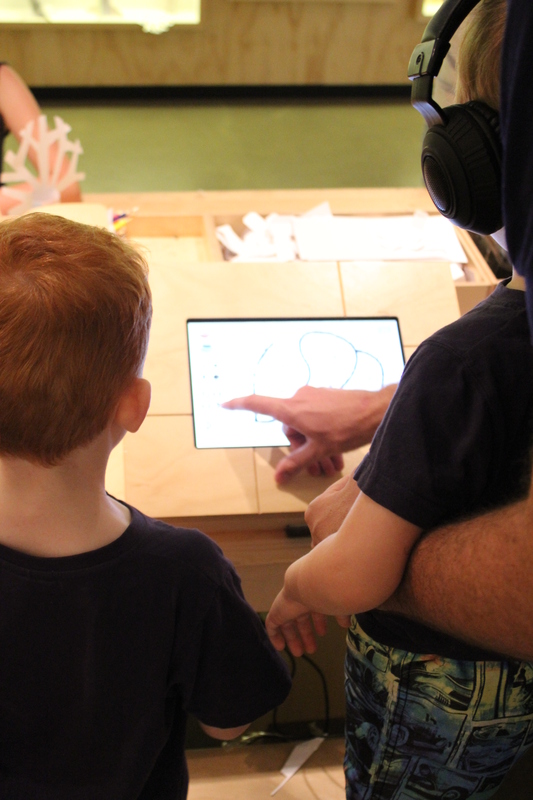 I checked out the GOMA webpage before we hit the streets, and was pleased to see there are currently two activity areas for children which are both free. There are several transport options – choose from bus, train or ferry – or drive in and pay a flat parking rate of $15. We chose the latter because it’s super exy to catch a train from our home just 15 kilometres away, and our little boys haven’t yet mastered public transport etiquette (but that’s a story for another day). Upon arrival we found that the car park was full, and opted for a street park on Montague Road, West End, which was a five-minute walk to the Gallery. And it only cost us $4. Win. I should probably mention here that we also used the car journey to instruct our children on Art Gallery Etiquette 101. The extent of the orders were “Don’t shout, don’t run, don’t touch (or lick) anything”. The licking thing was an afterthought but I’m glad it made in in there. I’m all about children being sensory learners but there’s a time and a place, and this day was about teaching them social skills for cultural experiences, among other things. Our toddler trying his best not to touch or lick anything. We made a diversion on the way to the Gallery, and then made our way in through the café on ground level. It was a bit of a nuisance navigating our pram and our pre-schoolers through the levels of the building. In order to reach the oases that were the free, colourful, light-hearted childrens’ activities, we had to travel through a maze of elevators because they service different levels in different spheres of the building. Confusing and annoying, to say the least. When we reached Cai Guo-Qiang Kids, it was well worth the effort. 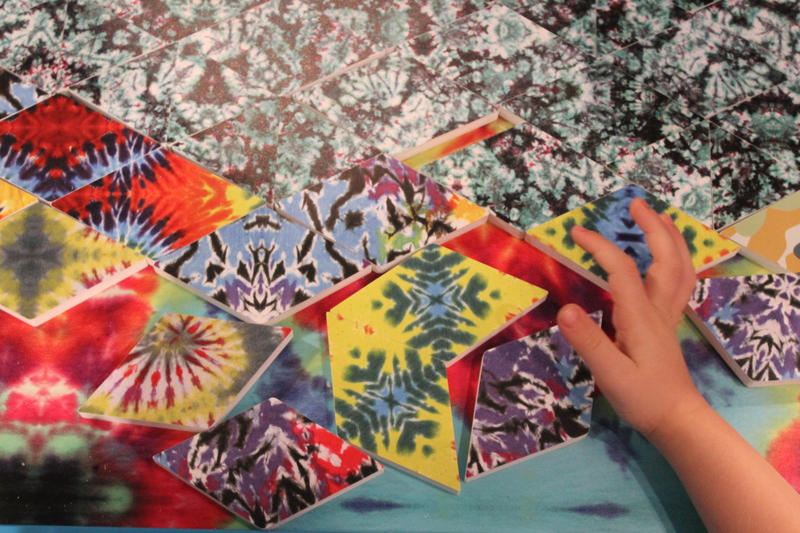 A room filled with busy children, purposefully creating and learning, it was an interactive and engaging environment. Along the centre of the room ran two large workstations for kids to create paper sculptures using pre-cut card, scissors, glue and pencils. The opposite side housed computer stations with headsets where the kids could create digital artwork, which would in turn be displayed on high screens at the front of the room. 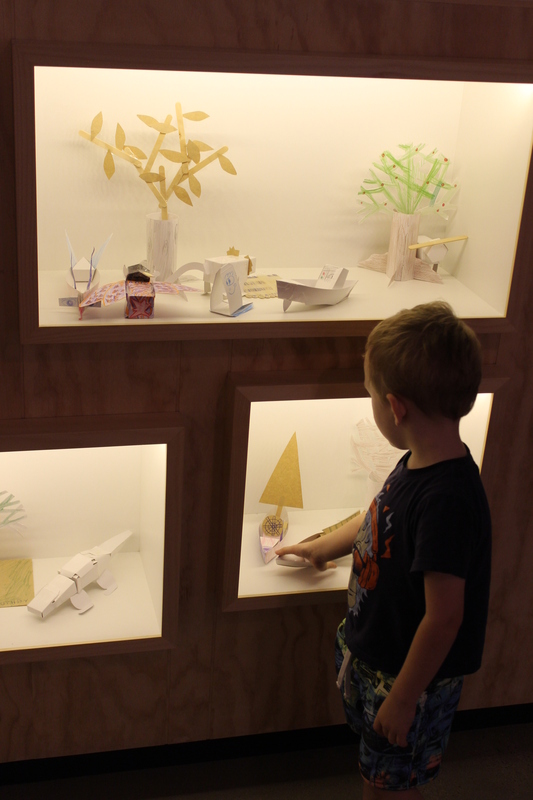 Particularly beautiful were the light-filled display boxes where children could leave their completed paper craft to be admired by future visitors. The space was full of families, yet maintained a sense of serenity due to the natural tones of the room, the calming nature of the activities, and the vigilance of the staff busily tidying and keeping materials in order. In stark contrast the Jemima Wyman Pattern Bandits room was a busy, vibrant, noisy and excitement-filled space. For our pre-school-aged children, this was the highlight of the outing. Several round workstations entertained and engaged children of all ages. Children could decorate a collage wheel, create a patterned bandana using stencils and fabric markers, play with tessellating patterned shapes, or dance in a black-and-white geometric-patterned room, copying the moves of masked dancers being projected onto a wall-to-ceiling screen. 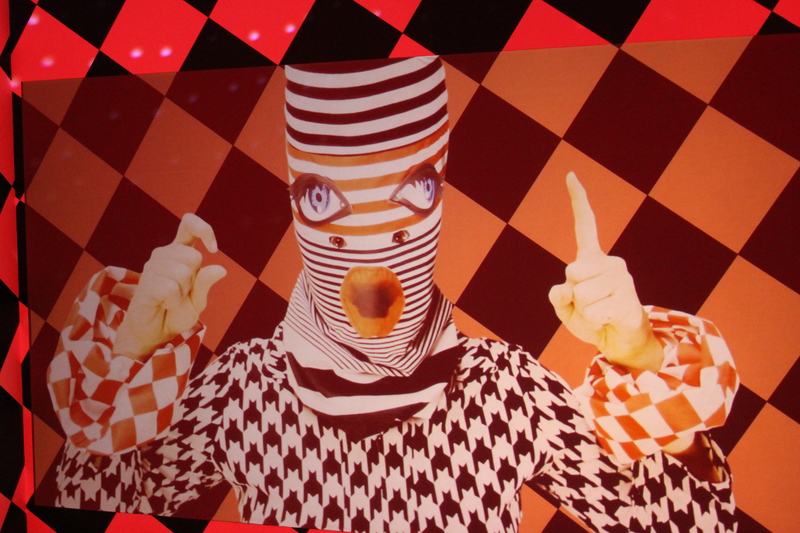 Dancing with masked pattern bandits. Baby loved sitting in her pram staring at spinning collage wheels which had been displayed on a colourful wall of pattern. Will and Sam enjoyed a narrow hallway filled with screens, which would display each child’s face (captured through a tiny lens at the top of the screen) in real time, moving within a pattern, like a piece of a beautiful kaleidoscope. 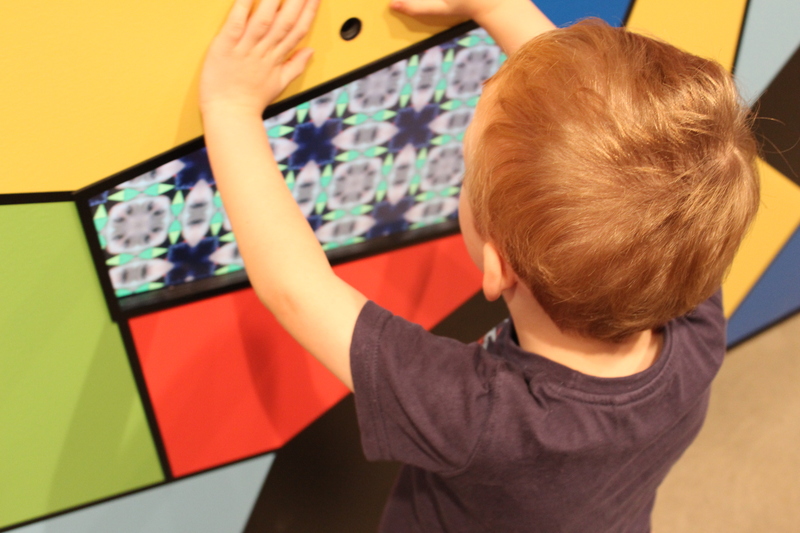 Interactive artwork: the child’s image is captured by a small camera and displayed within a moving pattern. This activity room was just… crazy… which upon reflection, is exactly why my children loved it; embracing the colour, the volume, the chaos, and the weirdness! Exploring shape and colour with tessellating shapes. When we’d had our share of chaos and disorder, we retreated downstairs to ground level to the Gallery’s licenced café, which overlooks the beautiful Brisbane River and the CBD on its northern banks. There’s a manicured grass lawn adjacent to the café that’s perfect for busy little bodies to run around on while their parents enjoy a coffee or a glass of wine – a relaxing way to end an afternoon of fun.